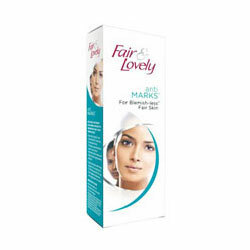 Buy Fair & Lovely AntiMarks Spot Eraser Pen reduces facial pigmentation, Nourishes skin cells, and improves Healthy skin cell renewal. 100% response to spot lightening. Visible spot lightening in 2 weeks. Do dark spots bother you? Do they reappear again and again on certain areas of your face? New Fair and Lovely ANTIMARKS Spot Eraser Pen is just the right solution for you. How does Fair & Lovely Anti Marks Spot Eraser Pen work? Its revolutionary Vita-Aloe Concentrate - a blend of Vitamin B3, Provitamin C & E, Aloe Vera, fruit principals, UVA and UVB sunscreens is designed to target and reduce pigmentation, accelerate healthy cell renewal and nourish skin cells. The unique pen tip targets and releases this deep action formula on your spots, which penetrates into 5 layers of skin. This target the damage from deep inside to fade dark spots and prevent them from reappearing. Place the pen hole on the spot, gently press down on the groove to release the deep action formula with the finger tip, gently on and around the spots untill it gets completely absorbed. For best results, use daily on cleansed skin. Wipe the pen hole clean after every use. Mild irritation and tingling is an indication of product efficacy. Do not stay too long in the sun, even while using a sunscreen product. Store away from direct sunlight and heat. In case skin irritation persists consult a dermatologist or discontinue use. Avoid contact with eyes. In case of contact, rinse well with water.